“The housing market has experienced strong price growth but from low levels. In nominal terms at end-2012, house prices rose 14.9 percent y-o-y in Vienna compared with 11.5 percent y-o-y for Austria overall. 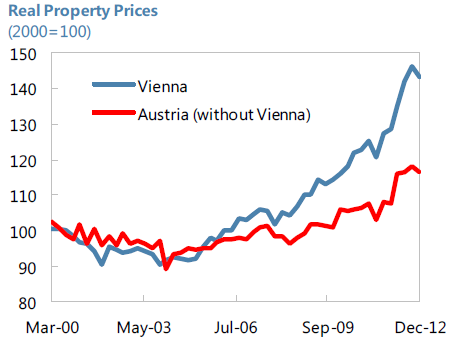 In real terms and from a medium-term perspective, the price increase appears more modest: a cumulative 40 percent over 10 years in Vienna and about 5 percent in the rest of Austria. Housing market activity seems to be driven largely by non-resident buyers and domestic investors seeking an alternative to low fixed-income returns, though continued immigration also likely supported demand for housing in urban areas. Mortgage credit has exhibited slow growth, suggesting the prevalence of equity buyers,” according to the IMF’s annual report on Austria.